David serves as a board member, but is also the founder of our hunting program. 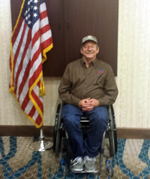 David has made it possible for people with the severest disabilities to successfully hunt and enjoy life to the fullest. David is married to Kathleen and has two children.